This wonderful tailormade Birding and Tiger Safari in India visits Sultanpur Bird Sanctuary in Dehli; Keoladeo Ghana in Bharatpur & Chambal Lodge, before visiting the Taj Mahal in Agra. From here take the train to Satpura National Park, with birding on foot, by canoe on the river & by jeep, before visiting Pench Tiger Reserve. English speaking driver & birding guides in each destination included. You will be met at Delhi Airport and transferred to your hotel. This ancient capital of kingdoms and empires is now a sprawling metropolis. Its strategic location was one of the main reasons why successive dynasties chose it as their seat of power and today it is a conglomerate of seven cities. The division between the old walled city and New Delhi marks a division in lifestyles, with the old city retaining its past traditions whilst New Delhi strives to match the pace of the 21st century. In the afternoon enjoy a half day excursion with a naturalist to Sultanpur National Park Bird Sanctuary. Situated 1.5-hours west of the city, it is home to over 150 different resident species including the Painted stork, Spotted owlet, Paddyfield pipit, Purple sunbird, Little cormorant, Gray francolin, Black francolin, Indian roller, White-throated kingfisher, Spot billed duck, White ibis, Black headed ibis, Little egret, Great egret, Cattle egret, India crested lark, Eurasian thick-knee, Red vented bulbul, Rose ringed parakeet, Red wattled lapwing, Shikra, Common hoopoe, Eurasian collared dove, Red collared dove, Laughing dove, Rock pigeon, Magpie robin, Greater coucal, Weaver bird, Bank mynah, Common mynah and Green bee eater. During the winter months bird numbers swell as over 100 migratory species arrive from Siberia, Europe and Afghanistan. These include the Siberian crane, Black tailed godwit, Greater flamingo, Ruff, Black winged stilt, Common teal, Common greenshank, Northern pintail, Yellow wagtail, White wagtail, Northern shoveler, Rosy pelican, Gadwall, Wood sandpiper, Spotted sandpiper, Eurasian wigeon, Spotted redshank, Starling, Bluethroat and Long billed pipit. 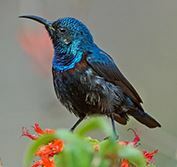 In the summer months there are also a few migratory species including the Eurasian golden oriole, Asian koel, Comb duck, Blue cheeked bee eater, Blue-tailed bee-eater, Black crowned night heron and Cuckoo (Note: The bird sanctuary is closed every Tuesday). This morning we leave Delhi and travel 4.5-hours to your hotel in Bharatpur. Note: When available, a horse cart will be used instead of a rickshaw. Today enjoy birding in Keoladeo Ghana Bird Sanctuary with a specialist guide, including a morning birding walk and 2-hour afternoon cycle rickshaw ride deeper into the park. Water birds: painted stork, cormorant, egret, asian open-billed, black-headed ibis, darter, shoveller, teal, bronze-winged and pheasant-tailed jacanas, ruddy shelduck, demoiselle and sarus cranes, gadwall, pintail, mallard, coot, purple moorhens. Raptors: king vulture, white-rumped vulture, marsh harrier, pied harrier, crested serpent eagle, ring-tailed fish eagle, short-toed eagle, black-shouldered kite, Pallas's fish eagle, tawny eagle, collared scops owl, spotted owlet, dusky horned owl. Others: lark, pipit, kingfisher, dove, myna, bulbul, blue jay, oriole, plum-headed parakeet, hoopoe, shrike, bee-eater, wagtail, finch. Migrants: steppe eagle, pale and marsh harriers, osprey, common teal, Indian little ringed plover. Enjoy another morning of birding in Keoladeo Ghana National Park with a guide. In the afternoon we drive 2.5-hours to Chambal Wildlife Sanctuary. This national reserve was created to protect the critically endangered gharial (also known as the gavial, or fish-eating crocodile), the red-crowned roof turtle and the endangered Ganges river dolphin. It also offers excellent birding opportunities. Today is dedicated to bird watching in the national Chambal Wildlife Sanctuary, including a shared morning boat ride and a shared afternoon jeep safari with a birding guide. Located along the pristine Chambal River, this wildlife reserve consists of arid deciduous forest separated by many ravines and hills, with some sandy beaches. You can find over 320 different species of resident and migratory birds here, including some from Siberia. Vulnerable species include the Indian courser, Indian skimmer, Sarus crane and Pallas's fish eagle. The Pallid harrier and Lesser flamingo are near threatened, with other species including the Greater flamingo, Great thick-knee, Brown hawk owl and Darter. Winter visitors include the Black-bellied tern, Ferruginous pochard, Red-crested pochard and Bar-headed goose. Animals you will find in this reserve include the Muggar crocodile, Indian wolf, Smooth-coated otter and Striped hyena. 8 of India's rare turtle species are also found here, including the Three-striped roof turtle, Indian narrow-headed softshell turtle and Crowned river turtle. You may also see the Indian flapshell turtle, Soft shell turtle, Indian roofed turtle, Indian tent turtle and Monitor lizard. Mammals include the Jungle cat, Wild boar, Rhesus macaque, Hanuman langur, Indian flying fox, Golden jackal, Bengal fox, Common palm civet, Indian small mongoose, Indian grey mongoose, Sambar, Nilgai, Blackbuck, Indian gazelle, Northern palm squirrel, Indian hare, hedgehog and porcupine. Note: In the winter months wear warm clothes, including woolly hats and gloves, to protect you from the wind chill in the morning & evening. This morning enjoy another early morning boat ride on the Chambal River. Afterwards we drive 1.5-hours to the ancient city of Agra, set along the banks of the Yamuna River and originally the capital of the Mughal Empire. Agra is world renowned as the home of the Taj Mahal - that great symbol of love built by emperor Shah Jahan in the 16th century as a memorial to his beautiful wife Mumtaz Mahal. On arrival we visit Agra Fort, a massive structure with walls over 70-ft high and 1.5-miles long that encompasses an astounding collection of well preserved buildings, many of them completed during the reign of Shah Jahan. After he was deposed by his son, he was imprisoned in this fort where he remained until his death - spending the rest of his life looking out along the river to the final resting place of his beloved wife. We also visit the much quieter Itmad-ud-Daulah - fondly known as the "Baby Taj" as this mausoleum, built to honour the grandfather of Mumtaz, was the forerunner of the Taj Mahal. At the end of the day we visit the stunning Taj Mahal. This magnificent white marble mausoleum took 22 years to build and, apart from its stunning design and perfect symmetry, it is noted for its elegant domes, intricately carved screens and some of the best marble inlay work ever done. Sunrise and sunset are particularly good times to visit and see the dome subtly change its colour. Note: Taj Mahal is closed every Friday. You cannot take anything in with you except your camera, water and medicine. This morning transfer to Agra Railway Station in good time to board the 08.05 train travelling 6.5-hours to Bhopal (executive class). You will be met at Bhopal Railway Station and transferred 3.5-hours to Satpura National Park. Named after the Satpura Range, this rugged reserve with its sandstone peaks, narrow gorges, ravines and dense forests preserves over 850 square miles (2,200 sq.km) of the central Indian highlands eco-system - together with the adjoining Bori and Pachmarhi wildlife sanctuaries. With an altitude ranging from the level plains of Churna (984 ft / 300 m) to the Dhoopgarh Peak (4,430 ft / 1,350 m), this park sustains a wide diversity of birdlife, animals and plants. This morning enjoy exploring the dense vegetation of Satpura National Park on foot with your birding guide, followed by a canoe ride down the Denwa River. In the afternoon venture further afield on a jeep safari. Satpura is home to a wide variety of butterflies and over 300 species of birds that live in these lowlands, wetlands and mountains. During the winter months many build their nests and roost here, making this a particularly rewarding time to visit. You can hope to see the Peacock, Grey hornbill, Malabar pied hornbill, Black shouldered kite, Treepie, Shikra and many more species. This park is very rich in biodiversity and in this sanctuary you can also hope to see sambar, nilgai, chital, Indian muntjac, four-horned antelope, chinkara, wild boar, black buck, fox, porcupine, flying squirrel, mouse deer, Indian giant squirrel and the elusive leopard. Leopard and Sloth bear sightings in this park are particularly good, but tiger sightings are rare. The flora is also very interesting, consists of mainly sal forest with teak, tendu and mahua trees. You will also find bamboo, Indian gooseberries, bel fruits and many grasses and medicinal plants. Today enjoy a full day jeep safari, taking the 20-mile (30 km) Churna Route deep into the forests of Satpura National Park. Birdlife is prolific, but this route is notable for its Sloth Bear sightings. You can also hope to see leopard, wild dogs, Indian gaur (bison), malabar squirrel and nilgai. The probability of seeing a tiger is also higher in this zone, but sightings are still relatively rare. A hot lunch is included today at Churna Forest Guest House. This morning enjoy another jeep safari in Satpura National Park. Afterwards we drive 4-hours to Pench National Park, situated in the lower reaches of the Satpura Hills. Check into your lodge in this beautiful tiger reserve that is rich in diversity and supports an abundance of flora, fauna and aquatic life. This morning enjoy a game drive in beautiful Pench National Park that inspired Rudyard Kipling to write his famous childrens story - The Jungle Book - featuring Mowgli the man cub, Shere Kahn the tiger, Baloo the sloth bear, Kaa the snake and King Louis the amusing ape. Tiger sightings are good in this small reserve which is divided by the Pench River, but are never guaranteed. You may also see chital, sambhar, nilgai, wild boar, jackal and barking deer. Jungle cats and leopards are also present but rarely seen. There are also over 170 different species of birds.. In the afternoon return to the park for another game drive. Note: This tiger reserve is closed every Wednesday afternoon, when only a morning game drive is offered. The park is also closed during the Holi & Diwali festivals, as well as during the monsoon season (July to early October). Please note we always try to book private jeep safaris, but these can only be reserved 120 days in advance and cannot be guaranteed - in which case your game drive will be in a shared jeep or 20-seater canter. In the winter months, morning safaris require warm clothes including woolly hats and gloves to protect you from the wind chill in your open vehicle. Enjoy a final early morning jeep safari in Pench National Park. In the afternoon transfer 3.5-hours to Nagpur Airport for your flight to Delhi, where you will be met and transferred to your hotel situated near the airport.